The day is hot and muggy, but cool weather is moving in. All at once, there's a thunderous rumble that sounds like an approaching freight train. The sky darkens and the wind picks up. A spinning cloud touches the ground, tossing roofs, cars, and trees skyward. A tornado is on the move. In Tornado, learn about what causes dangerous swirling storms--from water spouts to violent "twisters." 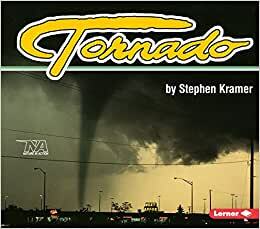 Amazing photographs and a clearly written text explain what happens inside the storm clouds and give you tips about how to stay safe--even if you live in "Tornado Alley." I bought this for my 3 1/2 year old future storm chaser. It has too many words for his attention span but is great for older kids. My little one did like looking at the pictures though. The pictures were very nice and the author takes the time to include how to pronounce some of the words, like mesocyclone, as well as define them. He also includes a glossary and fascinating facts section at the end. I find it to be a very comprehensive book for young weather enthusiasts.